When summer rolls around, muffins don’t generally come to peoples’ minds, mostly because no one feels like turning on the oven in the heat unless they have to (like for a birthday cake or some last-minute brownies/chocolate chip cookies that are suddenly necessary). Well, turn on your ovens, friends, because these muffins are amazing. While I could compare them to a cupcake, or state that these are basically the best muffins ever, those phrases are way too overused! 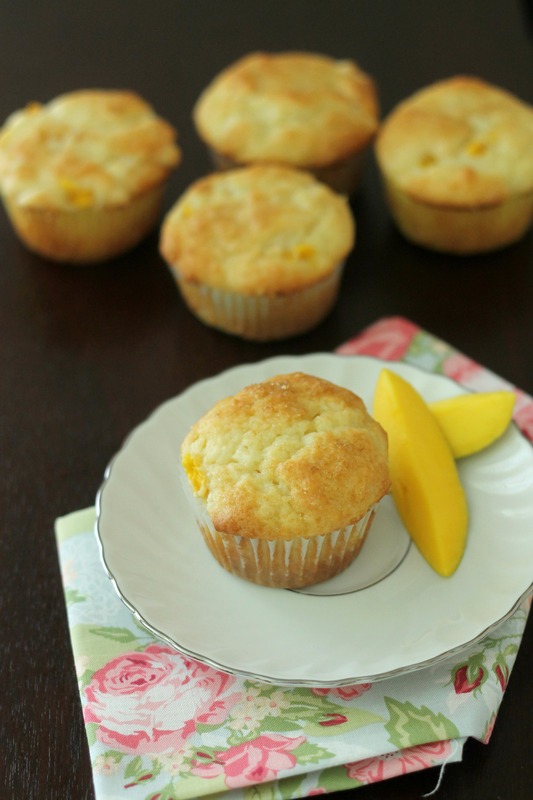 So, thanks to Leah, we came up with this comparison: these taste like what mango cobbler would taste like (if it exists) but in muffin form. Hopefully that makes sense! 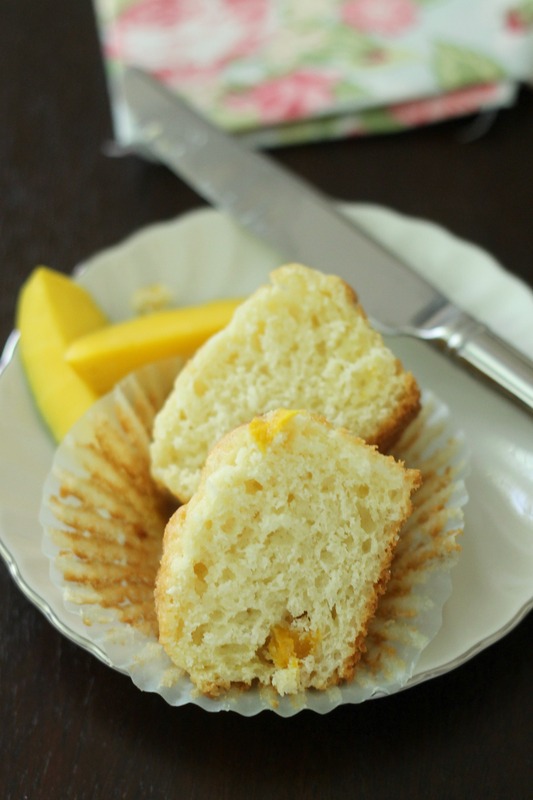 So, you should definitely make these muffins if you have mangoes sitting around, especially if they are 3/$1 mini mangoes that are a giant pain to slice when slightly underripe. Have I sold this recipe to you yet? That’s debatable, probably. P.S. These would probably be really good with peaches as well! Preheat oven to 400 degrees. Combine the 3 cups of flour, baking powder, baking soda, salt in medium bowl. Set aside. Cream butter and sugar in a large bowl on medium-high speed until fluffy, about 3 minutes. Add eggs one at a time, beating well after each addition and scraping the bowl as necessary. Add the vanilla extract and almond extract. Beat in half of dry ingredients, then add a third of the yogurt. Add remaining dry ingredients in two additions, alternating with the yogurt, until combined. Bake for 8 minutes at 400 degrees and then decrease oven temperature to 375 and bake for approximately 12 more minutes until the muffins are golden brown and a skewer inserted in the center comes out clean. Let the muffins cool for about 5 minutes in the pan before removing. Place them on a cooling rack to cool completely. They will keep for a few days at room temperature, but you can freeze them as well. Enjoy! What a flavor combination! I love white chocolate so much – and well, mangoes are my favorite fruit ever. I would love these muffins! I agree (well, I like a lot of fruits!). But these are a genius combination- I just had to make them! Mangos are pretty delicious! Thank you for the link- they look yummy! This person has been using your photo, I’m pretty sure, without your consent, and even had the nerve to add their own watermark to it. Thank you so much for bringing that to my attention! I did not give that person consent to use it and I am shocked that they would add their own watermark. I will leave a comment requesting that the person removes it, and if that is ineffective, I will use your link. Thanks for being a great reader and spotting this! I really appreciate it.